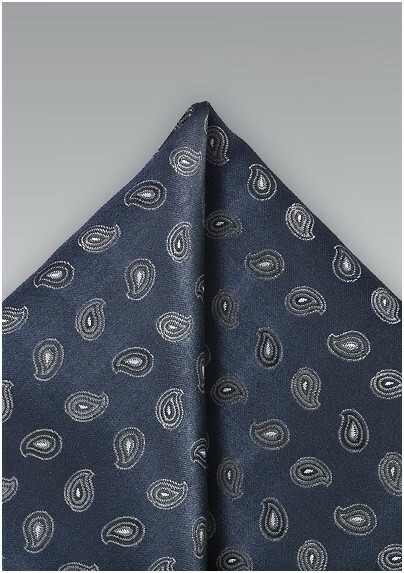 Amp up your most worn fashion pieces by accessorizing them with this high fashion paisley patterned pocket square in utilitarian hues of midnight blues, blacks and silvers. 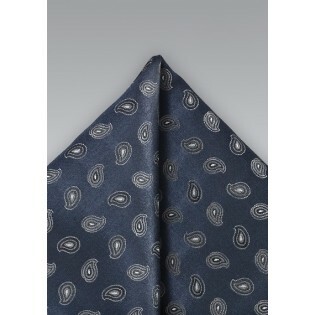 The designer paisleys are handwoven into the textile adding to the stately look and feel of the accessory. The small scaled paisleys have a conservative vibe to them which pairs smartly with navy blue blazers as well as midnight blue suits. Expertly fabricated and designed by the Cantucci Design Collective. Made from 100% silk.